In the new millennium, there can be few greater whisky success stories that than of GlenDronach. Literally rising from the ashes, GlenDronach has returned stronger from many disasters throughout its history. Found in the East Highlands, the distillery is picturesque centred around "Glen House," a 18th century grand cottage, so GlenDronach has links touching three centuries. Glendronach is known for its powerful, pungent sherried style, with heavy servings of prunes and figs- a result of having some of the best stocks of sherry casks in the business. In recent years, their single cask releases have won many plaudits from whisky fans. GlenDronach draws its water from local wells, known simply as The Source. Up until 1996 GlenDronach operated its own floor maltings, and dried the malt with a mixture of peat and coal smoke, meaning that expressions distilled before this time carry a stronger peat profile than the average Speyside or Highland malt. Their Bobby Malt Mill was built in 1913, and is still in operation, over a hundred years later. The mash tun is large, brass and uses a traditional half-rake system. They ferment in 9 large Oregon pine washbacks, again, sticking to the traditional methods. Two of the four stills are nearly two hundred years old, and are of particularly bulbous onion design, to maximise reflux and copper contact. Until 2005, they were directly coal fired, but changed to steam heated. GlenDronach was the last malt whisky distillery to make this change in Scotland. The spirit is condensed in worms using water from the local Dronach Burn. The distillery does not compute their middle cut, and instead relies upon the expertise of the stillman to judge the quality of the spirit. GlenDronach uses a mixture of casks- bourbon, port, marsala have all made appearances. 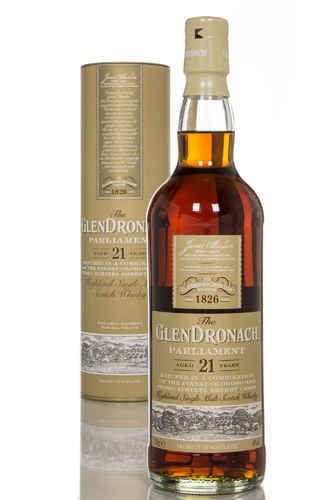 However, it is for excellent sherried whisky that GlenDronach has become known. 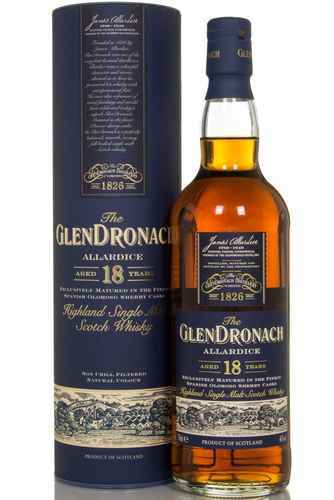 The GlenDronach that hits the shelves is overwhelming sherry cask, and extremely good sherry cask whisky at that. These sherry casks are stored in three dunnage and three racked warehouses. Like many distilleries, GlenDronach has a troubled history. Founded in 1826, by the eccentric James Allardyce, the distillery burnt down within a decade. Many whisky industry people were involved in restoring the distillery after the event, with Teaninich’s Walter Scott, Alexander Ross and Glenfiddich’s 'Captain' Charles Grant (younger son of William Grant). Glendronach would remain part of the Grant family portfolio until sold in 1960. William Teachers & Sons took over, and were subsequently absorbed by Allied distillers in 1976. Under the control of Teachers, the stills were increased from two to four, but remained coal fired, a rather unique feature as most distilleries had switched to indirect steam pan heating. In 1996, the distillery was sadly mothballed. Six years later it came back into usage again, and in 2005, the distillery’s owners were bought out by Pernod. This purchase left Pernod as the second largest spirits producer in Scotland, after Diageo. The new owner’s tenure was short and somewhat unhappy, changing the house style by maturing strictly in bourbon casks. Happily, in 2008, Billy Walker and the BenRiach group bought the distillery, and produced a new core range, of 12 year old, 15 year old and 18 year old, all matured in sherry casks. This brought great success to the distillery, and they soon released a series of single cask bottlings, which were lauded even more highly. Since then, GlenDronach has enjoyed great success, going from one of the smaller names in whisky, and "mothballed" status, to one of Scotch’s hottest distilleries. 8 Year Old Hielan Bourbon and Sherry cask, 12 Yeard Old Sherry cask, 12 Year Old Sauternes finish, 15 Year Old Revival (currently discontinued, though back soon), 18 Year Old Allardice, 18 Year Old Tawny Port, 21 Year Old Parliament, and the Cask Strength- which is released in batches. As previously mentioned, the Single Cask releases of GlenDronach are some of the best sherried whisky that money can buy. They release these every year, and they are always popular. The older releases such as "Grandeur", "Octaves" and "Recherché" are cult bottlings that have gone down in whisky lore. Founder James Allardyce once, after a failed sales trip to Edinburgh, cemented his products popularity with aspects of the capital’s society, but giving whisky to the city’s prostitutes for free. Billy Walker felt he needed to establish a brand identity core range that included a 15 year old expression. However, due to the timings of both the mothballing and the takeover, the whisky was likely to be between 16-18 years old. So if you’ve got a bottle of Revival, congratulations, you’re in luck! Glen House, the cottage at the heart of the distillery, is said to be haunted by the ghost of a Spanish lady who travelled over from Jerez in a sherry cask.